Puma SE is a German designer and manufacturer of sport and casual footwear, clothing and accessories and the third largest sportswear manufacturer globally. The company products are distributed in more than 120 countries. The company was founded by Rudolf Dassler in 1948 following a split with his brother Adolf Dassler. This split led to the parent company Gebrüder Dassler Schuhfabrik (Dassler Brothers Shoe Factory) being divided in Puma and Adidas. It has its headquarters located in Herzogenaurach, Bavaria, Germany. According to 2019 data, Puma has 13000 people working for it. PUMA’s mission statement is “Forever Faster”, through which it aims at giving athletes the necessary advantage to reach their full potential and express themselves through their own style of play. 2. Global presence in key sports performance and sport style accounts: PUMA has been affiliated with some of the greatest sports legends like Pelé, Maradona, Tommie Smith, Boris Becker, Lothar Matthäus, Linford Christie and several others. PUMA is also involved in improving the quality of its distribution and has broadened its presence in the sphere Sports Performance and Sport style around the world. The focus of the marketing expenses continues be on sports performance partnerships, such as those with the world’s fastest athletes like Usain Bolt and Andre De Grasse, greatest footballers like Antoine Griezmann and Sergio Agüero, golfers like Lexi Thompson and Rickie Fowler, football federations like Italy, Switzerland and Uruguay, football clubs like Arsenal FC, Borussia Dortmund and Chivas, the Jamaican and Cuban Olympic Federations and many others. New partners like Olympique de Marseille, Borussia Mönchengladbach and A.C. Milan have also been added to the PUMA family. It is also delivering ultra-modern, performance-ready golf clothing, footwear and accessories to the market. COBRA PUMA Golf engages in supplying technologically advanced golf equipment. MERCEDES AMG PETRONAS, Scuderia FERRARI and RED BULL RACING sponsored by PUMA dominated the phenomenal season of Formula One which proved to be the major driver of PUMA’s motorsport category. 3. Investments in operations and technology infrastructure: PUMA has accelerated and enhanced its operational processes and systems by upping PUMA’s International Trading Organization, launching new product development systems, benchmarking of ERP systems and advances to the overall IT infrastructure. With the revival of the www.puma.com, the Company has enhanced its existence in the field of ecommerce. Business Intelligence, Planning and IT Security are the major focus of PUMA’s 2018 investments in IT infrastructure. In this regard, a new Security Operations Center was formed to maximize protection from outside threats. Additional focus has been put on the development of a new ERP system slated to be running in fiscal 2019. 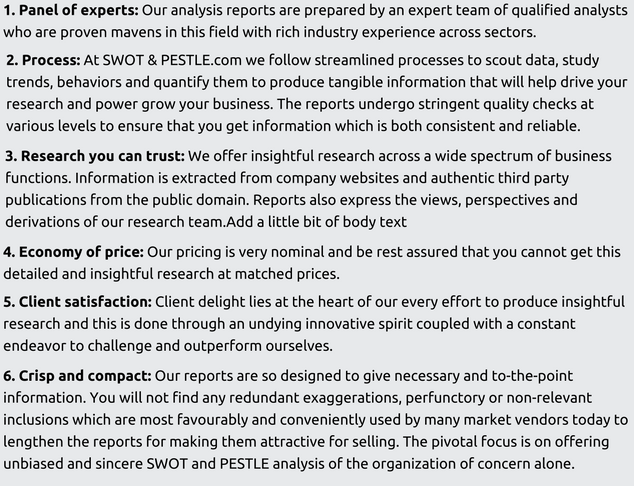 The remaining section of "Strength" is available only in the 'Complete Report' on purchase. 1. Adverse global political developments and uncertainty: Several geopolitical tensions and political discords such as the unexpected UK vote in favour of leaving the European Union continue to weigh on the political uncertainty factor. The UK was more dependent economically on the EU than vice versa. It is evident that the British exit from the EU will be accompanied by large economic and political costs for many years. The fate of the economy largely depends on the type of deal and new trading arrangements signed between the two entities. The economy was able to withstand the immediate aftershock of the vote, but the devaluation has begun reducing living standards which ultimately impact the ability of the consumers to purchase the premium sport brand like PUMA. The poor productivity growth has caused downfall in growth forecasts leading to deterioration in public finances and ultimately reducing the ability of the people to induce sportswear in their daily wardrobe. 1. Use of sustainable raw materials: The majority of impact on the environment surfaces from our products during the raw material creation and processing phases Life cycle studies and the Environmental Profit and Loss Account. The use of more sustainable materials, such as BCI cotton (40%), blue sign polyester (46%) and FSC certified paper and cardboard (92%), was increased and the use of solvent-free polyurethane was also manoeuvred by the brand PUMA. Puma has created targets for main materials like cotton, polyester, leather and cardboard. It is also looking to cut out hazardous solvents in the production of polyurethane. However, before a percentage target for polymer units can be a set, conducting a further research is of utmost importance. We feel that an industry-wide approach would prove be effective. PUMA has crossed its 2020 target with the percentage of recycled and/or Forest Security Council certified paper and cardboard reached to 95% after a temporary decline in 2016. FSC has certified its shoebox design, its paper-based shopping bags and hang tags. PUMA has joined a group working to produce DMF-free Polymer units in China and has also come up with a DMF-free PU shoe. 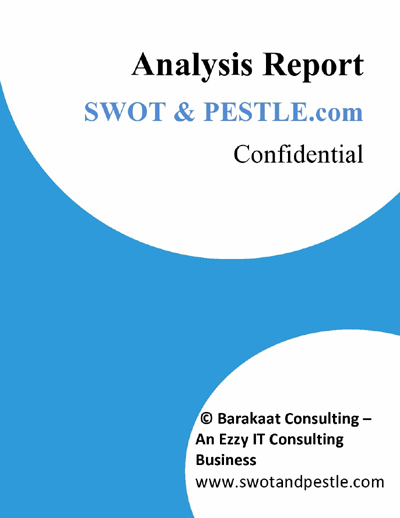 Puma SWOT and PESTLE analysis has been conducted and reviewed by senior analysts from Barakaat Consulting. 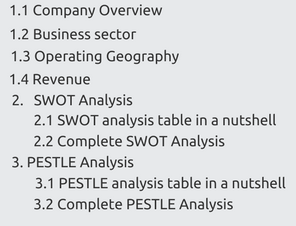 Copyright of Puma SWOT and PESTLE Analysis is the property of Barakaat Consulting. Please refer to the Terms and Conditions and Disclaimer for usage guidelines.